Doxycycline is a broad spectrum antibiotic for the treatment of Ornithosis in finches and Psittacosis in Parrots. Ornithosis and Psittacosis are now known as a Chlamydophila infection. A slow molt or lack of activity in the flock is an indication that something is wrong. A “one eye cold”, beak scratching, sneezing in juveniles or “pinched” triangular eyelids in adults are outward symptom of Ornithosis. During breeding season infertility, failure of hens to lay eggs, dead in shell, dying babies (from 1-5 days of age) and sudden death in breeding hens are signs of Ornithosis. Without veterinary testing, it is difficult to confirm Ornithosis as the cause of these symptoms. So if you have an avian vet who can perform these tests I always advise this route, but if you do not have access to an avian vet, a short course of Doxycycline & Megamix becomes a useful and safe method for detecting Ornithosis. A positive response to a 3 day long course, confirms the presence of disease and the need for a longer treatment which can be from 3 days to 30 days, or until you see a negative response to the treatment. No harm can be done by administering this treatment, even when Ornithosis is absent from your flock. Metal containers (except stainless steel) and minerals present in shell grits and mineral supplements have a negative effect on proper absorption of Doxycycline into the bird’s body. In the past it was always advised to remove all minerals and metal containers in order to achieve a full therapeutic effect from Doxycycline. However, removal of minerals during Doxycycline treatments has been found to inhibit recovery and create a degree of infertility and egg binding problems. 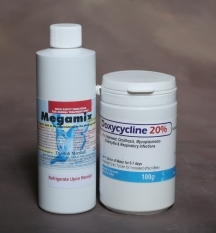 The addition of minerals may continue when Megamix is added to the drinking water during the Doxycycline treatment. The addition of Megamix has an acidifying effect on the crop contents that helps reduce Thrush infections that can be associated with Doxycycline treatments. A 3 day trial treatment to determine the presence of Ornithosis should begin at least 8 weeks before the start of the next breeding season because Doxycycline may temporarily render healthy birds sterile. If your initial trial determines that the entire aviary should have the 30 day treatment, it should be completed 4 weeks before the next breeding season begins. The best time for treatment would be at the completion of the annual molt before the beginning of the austerity period begins. I have treated my own flock with Doxycycline/Megamix every July for the last 5 years, immediately before I start the 4 weeks Austerity Diet, with great success. If the initial trial of Doxycycline/Megamix determines that one or a few birds would benefit from the complete 30 day treatment, those birds should be separated from the rest of the flock for treatment. Unless your previous breeding season showed widespread infertility and nestling mortality across a large number of nests, it is wiser to remove unproductive pairs to a hospital cage for a course of Doxycycline/Megamix rather than treat the entire flock. If the entire flock shows a positive response to the 3 day Doxycycline/Megamix trial, I recommend housing the birds in small holding cages so that as you begin to see negative responses in individual birds you can easily catch them to be removed from the treatment. Not every bird will need the full 30 day treatment. The length of time for treatment will be determined by the infection rate of each bird. Some birds may continue to show a positive response until day 7, others until day 15 and still others may go the full 30 days without ever showing negative signs. Once you begin to see inactivity and a fluffed posture in individual birds, they should be pulled from the treatment and given KD Water cleanser for 2 days. If these birds do not rebound after 2 days on KD, they should be placed in a hospital cage, provided heat and administered Nystatin for 5 days to eliminate a Thrush (Candida) infection. After that they can go back on their normal drinking water regimen until the rest of the flock completes the Doxycycline/Megamix treatment. Those birds that show a negative response early in the treatment are the healthiest birds in your flock, while those that go the full 30 days may be carriers and should be removed from the breeding program. Birds do not develop immunity to Ornithosis and may become re-infected after treatment. The introduction of new birds is a common source of Ornithosis to previously healthy flocks. 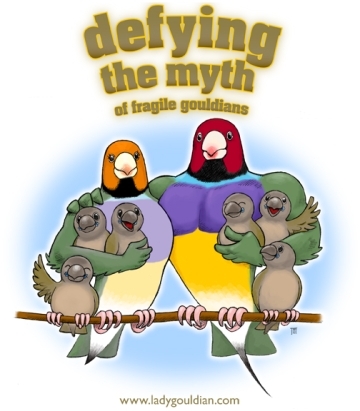 New birds must be quarantined for at least 6 weeks before being introduced into an existing flock. They should always receive a trial course of Doxycycline/Megamix treatment while in quarantine. If the new birds show a positive response to the 3 day trial, they should receive the full treatment or until they show a negative response. By treating all new birds, you can lesson the probability that you will have to treat the entire flock before each breeding season. 1. A complete treatment with Doxycycline/Megamix should only be administered when there is a positive response to the treatment trial. 2. Doxycycline/Megamix should be continued until birds become quiet and fluffed up. This may be as short as 3 days (in aviaries with no Ornithosis) to 30 days (in birds infected with Ornithosis). 3. The food should be enriched daily with vitamins and minerals during the course of treatment. These supplements may be added to the dry seed or into a soft food. 4. The surfaces of cages, aviaries and food stations must be disinfected once a week during the Doxycycline/Megamix treatment. 5. After the Doxycycline/Megamix treatment, KD Water Cleanser should be added to the drinking water for 2 days. Do not add anything else to drinking water containing KD Water Cleanser. 6. If treatment goes too long and birds do not rebound when KD is added to their drinking water, they should be given Nystatin for 5 days to eliminate the Thrush (Candida) infection. 3. Mix fresh each day of treatment, do not mix large quantities and hold it for several days. Remove all other sources of moisture during treatment period. This would include bath dishes unless they also contained Doxycycline/Megamix, fruits, veggies and greens.